I couldn't choose one book to offer today, so I picked two. That means there will be two winners this week. First book is "Alice's Adventures in Wonderland" and "Through The Looking Glass" by Lewis Carroll. It's a lovely collector's edition bound in red leather with gilt edges. It's from Longmeadow Press, 1985. The second book is T.S. Eliot's "Old Possum's Book of Practical Cats." It's a later printing of the first edition from 1939. Contest now closed, winners announced shortly. Such a tough choice, but I think I'd prefer Eliot if I win. Then again, Alice is gorgeous, so I'd be happy with either. I would prefer the Eliot--my daughter would love it! Wow - these are both very, very cool. I would love to win the T.S. Eliot, though! I always need more Alice, darling. You give away some of the best books! I have no preference, as I love both the story and the poetry. Oh that Alice edition is quite beautiful! This is how the book giveaway ends. Not with anyone else, but with ME winning. Sign me up for the Eliot! What a wonderful giveaway! It'll be nice to have each of these books, but maybe my preference declines to "
Alice..."! Many years ago I played her role in a school performance (in English!! ):)I like Caroll's style! Please enter me to win the Eliot! Thanks! Please enter me to win the Eliot book! It was one of my favorites as a kid :) Thanks! they both look lovely! but I prefer Alice in this case. My daughter would love either one! Thank you for the fun contests! The Lewis Carroll book would make an excellent birthday present for my friend! I would love to win either of these. 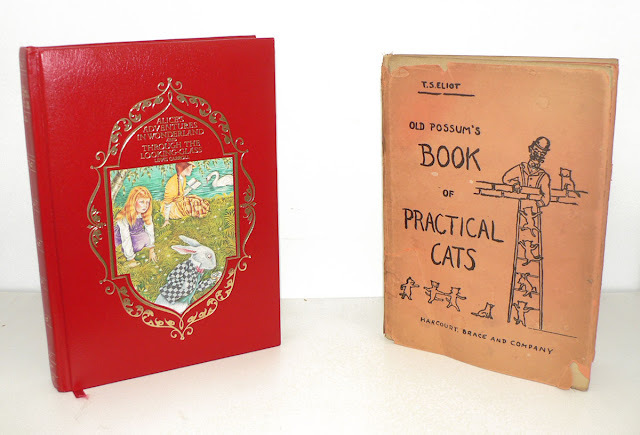 I'm sure the Alice book is nice, but I'd love to win Old Possum's Book of Practical Cats. They are, aren't they? Practical, I mean. I love cats. I would like the one with the cats. Both are excellent but I'd prefer the Eliot if I won. I'm one of the few ppl who admits to loving the musical 'Cats' and have seen it 4 times. Please enter me in the give away! Count me in for another great giveaway. Another fantastic giveaway! If I won, I'd prefer the Eliot. Thanks! Oooh, I'd be pleased as punch to win either one! I would love the Alice book, but I would be happy with either one. Would love to get in on this win! Both books look great, but the Eliot would be a fantastic gift for my fiancée, owner of four cats herself. Thanks for the giveaway, love the blog. I love the cat one! Please considered me entered! I'd love to be entered for "Old Possum's Book of Practical Cats." Either of these would make a fantastic addition to my collection. I'd like to win one of these, count me in! Ah, the Alice would be lovely! I can't choose, so if I'm lucky enough to win, I'll take either. Surprise me! I would take either. Surprise me! Either would be great, but I think I'd like the TS Eliot. That copy of Alice is beautiful. Please enter me! I would love either, but would prefer the TS Eliot Book. I would love the Eliot! Both wonderful but with a new baby girl in the family coming very, very soon, I'd opt for Alice. Awesome! Either would be really great to house. Count me in. What fun books...I think I would go for the TS Eliot. I would love to win either of these! Great choices this week. I love The TS ELLIOT's one but I also am a fan of Alice! Alice, please! and thank you! Love them both, and would accept either one, but slightly prefer T.S. Eliot. I would like the Lewis Carroll, thanks. I'd adore either! Thanks for the opportunity!